Discussion in 'Norton Commando Motorcycles (Classic)' started by Tornado, Aug 8, 2018. Today I replaced the 45 year old rocker feed lines with fresh air brake lines as some on this forum recommended. Was a surprise to discover the feed banjos are not barbed in any way and the lines just force fit on to the spigots. The originals were not fully seated to the banjo ring...more like only half way along the spigots. I put the new ones all the way home. New 5/16" copper sealing washers all around. 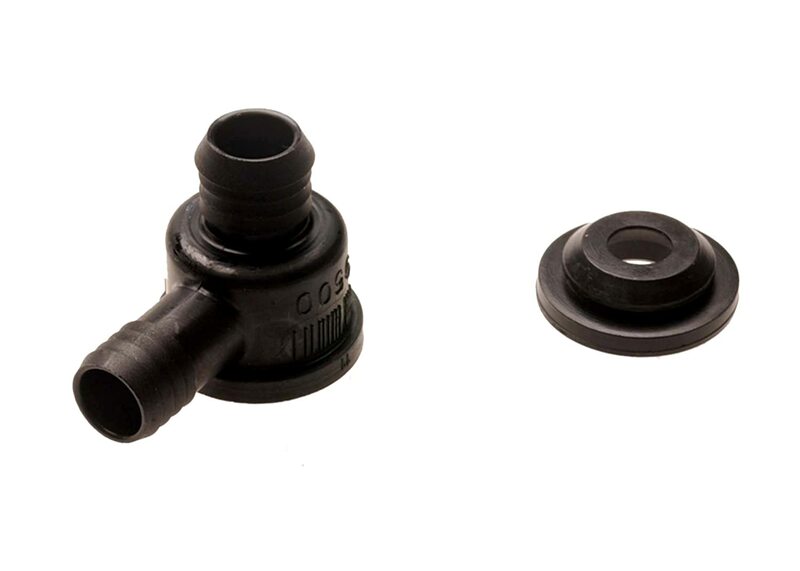 Also picked up a little vacuum brake boost check valve to use on the breather hose as a PCV...same type as others have mentioned on these forums elsewhere...black plastic barrel with 5/8" & 3/8" barbed hose fittings at 90 degrees to each other. Tucked in nicely along the top inside edge of the oil tank...only had to remove the short metal adaptor pipe between 5/8" engine side hose and the 3/8" tank hose. Seems to be working OK...while running engine, the positive air pulses coming out the tank vent seem to weaken after starting and no suction can be felt there. Hoping these changes will address the leaking rocker cover points and feed line seeps. Yes, but there are some using the same as mine claiming quite a lot of improvement...for $10, locally available and ten minutes to installl...its a good test setup. Happy to report seems to be working for after a good long ride. Only place I'm seeing leakage is the intake rocker cover nut...I've put in a copper sealing washer coated with Permatex Aviation gasket sealer...still see a little river running down from nut. I too put the $10 PCV valve on. When I later mounted the reed valve type, I checked the old PCV and it was not working at all, freely passing gas in both directions. Yep, same here. Less than 1000 miles from the first, but the second (Dorman 80190) is still "checking" after 9000 miles. I gutted the first one out of curiosity, and found it to be composed of a round, thin piece of rubber (of unknown origin) with a small center hole pierced over a spike at the center of the valve body. This held the rubber reed over a series of holes circumferentially located around the spike, which allowed the rubber reed to lift up with pressure from the crank case, but then shut off (until it broke) as the pistons rise. 'Pretty straight forward, and a whopping $4.29 at my local parts store. Can I ask the company used for the oil lines?? The air brake lines were found locally at Princess Auto. 1/4" OD Air Brake Flex...Here's a shot showing most of the labeling. It seemed to be slightly tighter fit than OEM...maybe just b/c fresh? I used a brake line flaring tool clamp to grip the hose beyond where the banjo spigot would pass, and just man handled the spigot into the end of hose using twisting back and forth. Not too hard to do. No leaks detected after 100 mile ride yesterday. And after another 200 mile day, not seeing any seeping from new feed lines, nor the copper 5/16" washers around banjos. The PCV check valve holding up as well, no more seemingly endless dripping from somewhere around/behind primary and also, rocker covers. I took the leaking intake rocker cover nut off this morning, cleaned up all surfaces and used a little Locktite 515 on the sealing surfaces...not a drop from there today. I do have a slight weep from right side spindle covers...need to get fresh gaskets.